In 1955, he organized a religious convention – sammelan -- at Chitrakoot, and in 1956 in Kanpur, where he invited the leading religious personalities of various spiritual missions of India. They delivered their speeches, and the convention successfully went on for fifteen days. During this time his name dawned in the hearts of many of the leading preachers and learned men. In the Kanpur convention the chief secretary of “Kashi Vidvat Parishad”, a great, learned person and a popular figure in Varanasi, (the center of literal wisdom of scriptures) happened to come and listen to Maharaji Kripalu’s speech. Completely overtaken by the scriptural wisdom of Maharaj Shree, he invited him to meet the scholars and the pandits of (Varanasi [http://varanasi.nic.in/] and thus, Shree Maharajji went there in 1957. When Shree Maharajji began his discourse in scholarly Sanskrit there was a mixed feeling of curiosity and anxiousness in the audience. But after his two hour discourse covering the critical topics of the bhashyas and the Brahm Sutra that invariably coordinate with the tenets of the Gita, the Upnishads and the Darshan Shastras, the audience was excited at the opportunity of learning more from him. The next day even the elderly pandits, who seldom attended anyone’s speech, came to listen to Maharajji. He spoke for six days, reconciling the philosophies of all the Jagadgurus, and the bhakti yog, which is explicitly described in the Bhagwatam, the core of all the scriptures. The scholars of Varanasi, and many others from other provinces of India, had never seen a teacher so well versed in the Vedas and the Upnishads, the Sutras, Upvedas, Vedangas, Darshan Shastras, Puranas, Itihas, and the philosophies of the Jagadgurus and the writings of the rasik saints. And all this from a humble and kind man absorbed in Radha Krishn Bhao that radiated from his personality. This was a landmark in the divine history of Varanasi.When Jagadguru Shankaracharya (sometimes Jagadguru Ramanujacharya or Jagadguru Madhvacharya) had debated and established their philosophy, they did it mostly on a one-to-one basis and only with the prominent scholars of that town wherever they went, in front of other people who simply listened. But this time all the learned pandits and the scholars spoke together in Varanasi with Shree Maharajji among them, propounding and reconciling the theory of the scriptures. So the pandits of Kashi Vidvat Parishad honored Shree Maharajji, announcing him as the Supreme Jagadguru of this age. 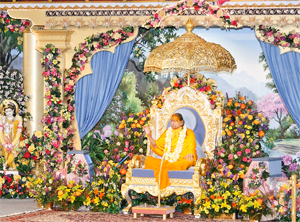 Shree Maharajji is therefore the fifth Jagadguru in the last 5,000 years. The nam sankirtan that he gives is the same that Chaitanya Mahaprabhuji gave five hundred years ago, so he is called Bhakti-yog-rasavatar (the descension of Radha Krishn love).